Some folks think of rock music when they hear the words, “REO Speedwagon”. But folks who have visited the R.E. Olds Transportation Museum near our Lansing Michigan Bed and Breakfast think of a 1923 car. An Oldsmobile, to be exact. 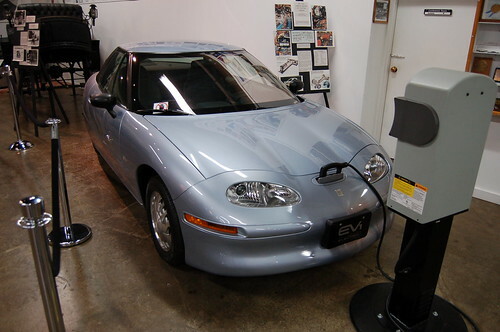 The 1996 GM EV1 Electric Vehicle. Michigan has always been the heart of the American Automobile empire. Detroit is the king of automobile manufacturing, of course, and for many years Lansing was a queen thanks to R.E. Olds. Just two years after the REO Motor Car Company opened its doors to the public in 1905, it had gross sales of over four million dollars. Trucks and automobiles are no longer manufactured in Lansing, but the legacy of R.E. Olds remains. See it at the R.E. Olds Transportation Museum. The museum’s collection is comprised of 60 cars and trucks ranging from the 1886 Oldsmobile Steam Carriage to the 2003 Cadillac CTS. Anyone and everyone who has ever admired a good looking automobile will enjoy visiting the Transportation Museum. See the inspiration for the band, a 1923 REO Speedwagon, and a 1932 REO Amb/Hearse. See a 1953 Oldsmobile NASCAR Race Car and a 1948 Oldsmobile Futuramic. The 1985 Olds Cutlass Salon ‘Darth Vader’ is not to be missed, nor is the 1996 GM EV1 Electric Car. The list goes on and on. If you’re traveling to Lansing for business, take a break and check out the museum (your colleagues may well join you). If you’re staying at our Lansing area Bed and Breakfast for pleasure, consider adding the museum to your itinerary. It’s fascinating to see how cars and trucks have morphed over the decades. How to best follow a trip to the Olds Museum? How about a luxurious meal at the English Inn, built in 1927 for the General Manager and President of the Oldsmobile Corporation. Additional information may be found at R.E. Olds Transportation Museum.